There are a number of types of roof shingles. What differentiates one type of shingle from another depends on the size, shape, color, thickness and material. There are basically three types of roof shingles: asphalt. wood and slate. Each type of shingle has its own pro’s, positive aspects, and cons, drawbacks. Asphalt roof shingles are one of the most popular types of shingles for a number of reasons. They are relatively cheap compared to other types of roofing materials. Three-tab asphalt shingles typically cost anywhere from $60 to $120 per square (100 square feet), although low-quality products can be found for less than $50 per square and high-end products sell for as much as $200 per square. Asphalt roof shingles’ life expectancy is 20 to50 years. Most often, the longevity of asphalt shingles comes out closer to 20 years rather than 50. But when the low cost is factored in, customers are satisfied with their purchase of asphalt roof shingles. Asphalt roof shingles are the easiest to install. They are also the shingles that are most often installed. Many times roofing professionals may not have experience installing some other types of shingles. Esthetically, asphalt roof shingles can be crafted to look like more high end shingles. Appearance is one of the most important considerations for a homeowner when having a new roof put on. They want to be sure that their new roof looks good. The drawbacks to asphalt roof shingles are significant. Asphalt shingles do not do well in climates that are either extremely cold or extremely hot. Asphalt shingles are used exclusively on steep sloped roofs. They cannot be installed on flat or low sloped roofs. They are also easily damaged by hail, wind and other natural causes. Wood shingles have a number of benefits. A wood roof that has not been exposed to harsh weather conditions can last about thirty years. The appearance of a wood roof shingles is striking and attractive to many consumers. They are eco friendly and can be recycled. They are energy efficient and can help homeowners to save on their utility bills. They do not crack or puncture and can withstand high winds. On the other hand, wood roof shingles cost more. They are also more difficult to install. They are susceptible to damage by fire. They also can rot and be prone to mold. Slate has the greatest longevity of the roof shingles. It can last for 100 years. There are some slate roofs that are well over 100 years old and still in good condition. Slate is a form of rock, and that rock surface enables slate to be water resistant. 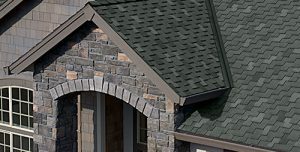 Finally, slate has an outstanding appearance, which is why a number of homeowners choose this type of shingle. On the down side, slate is the most expensive roof shingle. It’s difficult to install. Because it is a rock product, it is very heavy. It’s weight can be too much for the existing structure of some roof. To have a slate roof, many times the roof structure would have to be reinforced.